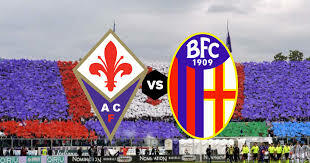 Fiorentina welcomes Bologna in a game from the 32th round of the Italian Serie A. Let’s take a moment to see what’s going on with these two teams before their clash at the Stadio Artemio Franchi in Florence. Fiorentina are 10th in the Serie A with 39 points won so far. La Viola have a record of 8 wins, 15 draws and 8 defeats since the beginning of the campaign. In their last five matches in the league Fiorentina are without a win – three draws and two defeats. This bad form is the reason why the manager Stefano Pioli decided to quit the job. He was replaced by the former coach of the team Vincenzo Montella, who will make a second debut for the club against Bologna. In their last game in the Serie A Fiorentina suffered a 0-1 loss against the struggling Frosinone at home. It was really a dissapointing performance by the home team. Daniel Ciofani scored the only goal in the game in the 84th minute, giving Frosinone the win. Meanwhile Bologna are 17th in the Serie A standings with 30 points, still locked in a fight against relegation. Right now the Rossoblu have 2 points advantage in front of the 18th Empoli and the danger zone. So far Bologna have a record of 7 wins, 9 draws and 15 losses in the league. In their last game in the Serie A Bologna celebrated a win, beating Chievo with 3-0 at home. Eric Pulgar scored two penalties for the home side, while Mitchel Dijks also scored. Bologna won four of their last five games in the Serie A, which tells us that they are in a very strong shape at the moment. That’s our thoughts about the Serie A game between Fiorentina and Bologna on Sunday afternoon. Who’s your favourite here? This entry was posted in REVIEWS and tagged 3 Soccer picks, ASIAN GOAL LINES, BETTING HANDICAP, betting tips, Bologna, Combo picks, Fiorentina, FOOTBALL BETTING TIPS, FOOTBALL PICK, PICK OF THE DAY, SINGLE TIP, soccer predictions, VIP Single pick, VIP SOCCER. Bookmark the permalink.